The Red Bull Air Race just suffered the first crash in its seven year history. 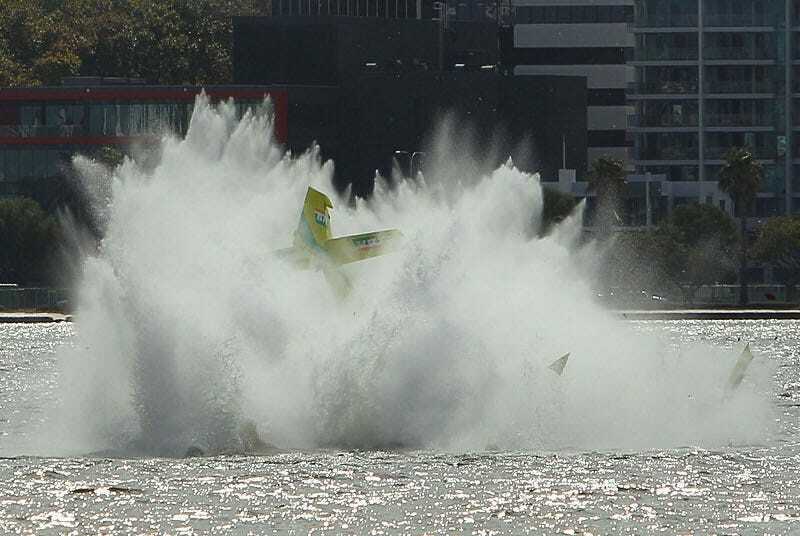 Brazilian pilot Adilson Kindlemann survives plummeting tail first into Perth's Swan River after his engine stalled in the middle of a chicane. The Red Bull Air Race is an international series of races that typically take place over water near major cities. Specially built race planes navigate tight turns around pylons and other obstacles specifically erected for the event. The Air Race will come to New York for the first time this June, flying over the Hudson River between Manhattan and Jersey City. Kindlemann was knocked unconscious during the accident and would have drowned if it wasn't for the Air Race's crack emergency response team, which had divers in the water with the crashed plane in under a minute. Kindlemann only suffered whiplash injuries in the crash. At least when the wheels explode off your formula one car, you don't face the risk of drowning.